Interstate 74 merges with Interstate 465 west for a 20.60-mile overlap through the south side of Indianapolis. Photo taken 11/05/09. Interstates 74 & 465 enter the city of Beech Grove on the mile approach to Exit 52 with Emerson Avenue. Photo taken 11/05/09. Interstate 65 crosses paths with the Indianapolis Beltway west of Beech Grove. The north-south route joins Downtown with Greenwood, Franklin and the south suburbs. Photo taken 11/05/09. Exit 52 partitions with Interstates 74 & 465 west for Emerson Avenue, 1.50 miles east of the directional cloverleaf interchange with Interstate 65 (Exits 53A/B). Emerson Avenue represents the main north-south arterial through Beech Grove, bisecting industrial interests to the east from residential areas to the west. Photo taken 11/05/09. A single point urban interchange (SPUI) facilitates the movements between Interstates 74 & 465 at Emerson Avenue in Beech Grove. Emerson Avenue leads north to Irvington and Sunnyview from central Beech Grove and south across Interstate 65 to Greenwood. Photos taken 11/05/09. Heading west toward Interstate 65 (Exits 53A/B) on Interstate 74 & 465 west. Interstate 65 travels 261.27 miles within Indiana, joining industrial Gary and the Chicagoland area with Lafayette, Indianapolis, Columbus, and Clarksville / Jeffersonville of the north Louisville metropolitan area. Photo taken 11/05/09. Exit 53A joins motorists with Interstate 65 north leading five miles to the Indianapolis central business district. Photo taken 11/05/09. Interstate 65 travels 887 miles overall between Mobile, Alabama and Gary, Indiana. The route provides a major trucking corridor between Chicago and Louisville. Further south the freeway undulates over low rise mountains and hills to Nashville, Birmingham and Montgomery, Alabama. Photo taken 11/05/09. Westbound at the Exit 53B loop ramp onto Interstate 65 south. Interstate 65 crosses the Ohio River southward 106 miles into downtown Louisville. The freeway carries six lanes to Exit 99 (Greenwood). Photo taken 11/05/09. Interstates 74 & 465 travel between the University Heights and Rosedale Hills communities west of Interstate 65. Photo taken 11/05/09. U.S. 31 splits from the Indianapolis Beltway and returns to its original alignment at Exit 2 (East Street). Photo taken 12/17/11. The University of Indianapolis can be reached by using Exit 2A and following East Street north to Hanna Avenue and east along Hanna. Photo taken 12/17/11. One half mile east of the directional cloverleaf interchange (Exit 2A) with East Street at the Louisville & Indiana Railroad overpass. East Street carries U.S. 31 signage northward to Madison Avenue originally. Madison Avenue southeast to Homecroft, Southport and Greenwood was a part of the 1948 created State Road 431. Photo taken 12/17/11. Exit 2A leaves Interstates 74 & 465 west for East Street north to the University of Indianapolis and Madison Avenue for Downtown. Exit 2B loops onto U.S. 31 (East Street) south to Greenwood. U.S. 31 mirrors the Interstate 65 corridor south to Franklin, Columbus and Louisville, Kentucky. Photo taken 12/17/11. Exit 2B loops onto U.S. 31 (East Street) south to Greenwood. U.S. 31 mirrors the Interstate 65 corridor south to Franklin, Columbus and Louisville, Kentucky. Photo taken 12/17/11. Am alternate shield for Interstate 65 north stands along the beltway at Lick Creek. A transmission corridor bee lines westward across the I-465 to a substation near Exit 4. Photo taken 11/05/09. Elevating over Meridian Street, former State Road 135, on Interstates 74 & 465 west. Indiana 135 continued Meridian Street south from U.S. 31 and Downtown to Thompson Road, where the route currently turns east from the south to end at U.S. 31 (East Street). Photo taken 11/05/09. Indiana 37 south appears on this shield assembly as the state road prepares to split with the Beltway at forthcoming Exit 4. U.S. 36, U.S. 40 and Indiana 67 continue along the freeway in unsigned fashion. Photo taken 11/05/09. One mile east of the diamond interchange (Exit 4) with Harding Street and the departing Indiana 37 south. Harding Street north was slated to become the Harding Freeway in the 1968 Indianapolis Transportation Plan.1 The unbuilt route followed the existing surface road north to Oliver Avenue (north of Interstate 70) and a planned alignment northwest to Interstate 65 and Kessler Boulevard. Photo taken 11/05/09. Angling west southwest along Interstates 74 & 465 near the Bluff Road underpass. Bluff Road represents the former alignment of Indiana 37 north to West Street and Downtown and south to Glenns Valley. Photo taken 11/05/09. Indiana 37 provides a multi-lane highway southwest from Indianapolis to Waverly, Martinsville and Bloomington. The state road doubles as the northern leg of the future Interstate 69 corridor between the capital city and Evansville. Construction is underway along a significant portion of that route during 2009-2012. Photo taken 11/05/09. The exchange with Harding Street is not planned to be upgraded for Interstate 69. Instead a new alignment will take the route to a point or mile or so west along the Beltway. Indiana 37 exists in two portions: the south segment leads from Marion to Tell City, the north segment travels between Fort Wayne and Ohio 2. Photo taken 11/05/09. Interstates 74 & 465 travel along side a rock quarry to the north and the Sunshine Gardens neighborhood to the south. Photo taken 11/05/09. Continuing west, motorists span the White River on the one mile approach to Mann Road (Exit 7). Photo taken 11/05/09. The same transmission corridor that crossed over the Beltway at Lick Creek reappears at the Exit 7 half diamond interchange with Mann Road. Mann Road ventures north to Kentucky Avenue (former Indiana 67) at Mars Hill and south to Landersville in Morgan County. Photo taken 11/05/09. Curving northwest along Interstates 74 & 465 west at Mann Road (Exit 7). Photo taken 11/05/09. 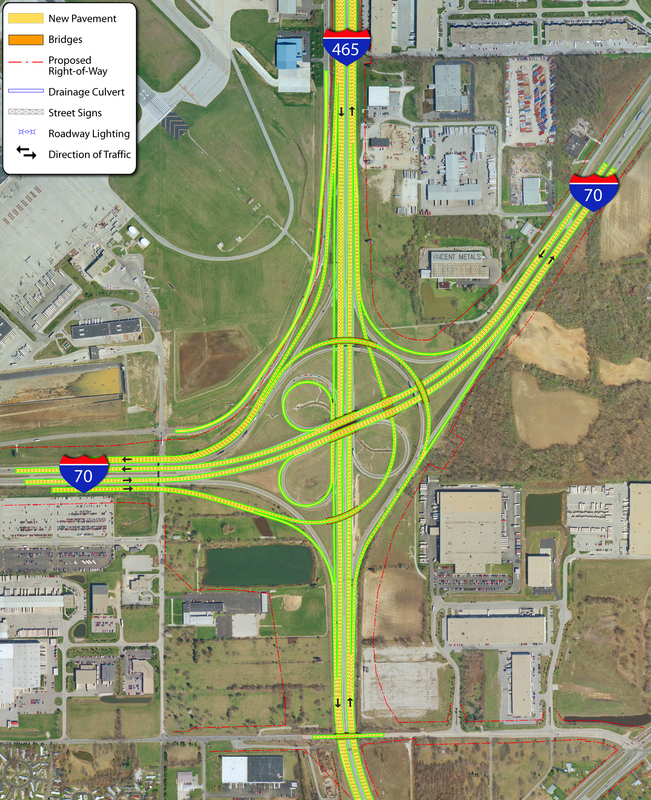 Indiana 67 parts ways with Interstate 465 at the forthcoming folded diamond interchange with Exit 8; Interstate 70 follows at a directional cloverleaf interchange (Exit 9). Photo taken 11/05/09. Kentucky Avenue carries Indiana 67 from Exit 8 through the southwest suburbs to Valley Mills and Mooresville. Kentucky Avenue east represents former State Road 67 east through Mars Hill and Maywood to Harding Street. The sprawling AmeriPlex office complex can be reached along Indiana 67 to the south. Photo taken 11/05/09. Northbound at the off-ramp (Exit 8) to Indiana 67 (Kentucky Avenue). Indiana 67 constitutes a 199.3-mile route from Vincennes to Ohio 29. To the south, Indiana 67 remains a four-lane expressway around Mooresville and past Martinsville before going down to two lanes. Photo taken 11/05/09. 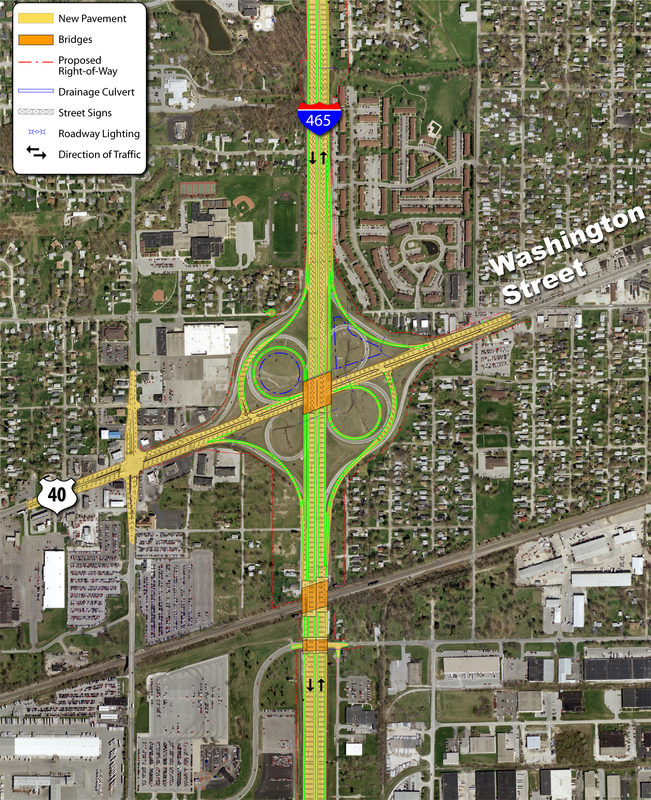 Expansion and reconstruction of Interstate 465 from Mann Road north to the Interstate 65 took place as a part of the Accelerate 465 project aimed to expand the beltway and redesign antiquated interchanges. Widening expanded portions of the road to eight and ten lanes along this stretch. Up ahead, Exit 9 consists of a two-lane ramp to Interstate 70 west to Indianapolis International Airport (IND) and Terre Haute and Interstate 70 east to Downtown Indianapolis. A new two-lane directional ramp joins I-465 north with I-70 west. Photo taken 11/05/09. Second photo taken 12/17/11. Approaching the Hanna Avenue overpass along Interstates 74 west & 465 north. A dismissed alternative to the I-70 and SR 67 interchange project included four sets of ramps linking the two interchanges independent of the Beltway mainline. Photo taken 11/05/09. Interstate 70 stretches 156.60 miles across Indiana. The 2,153-mile route begins at Cove Fort, Utah (Interstate 15) and leads east to Denver, Salina, Topeka, Kansas City, St. Louis, Indianapolis, Columbus, Wheeling, Hagerstown and Baltimore, Maryland. Photo taken 11/05/09. Second photo taken 12/17/11. Interstate 70 was reconstructed in the mid-2000s from Interstate 465 west to Ronald Reagan Parkway (Exit 68) to coincide with a relocation of the Indianapolis International Airport passenger terminal and expansion of the runways. The northbound Interstate 465 to westbound Interstate 70 ramp was widened to two lanes as part of the interchange reconstruction. To the east, a six-mile drive returns motorists to Downtown. Photo taken 11/05/09. Second photo taken 12/17/11. 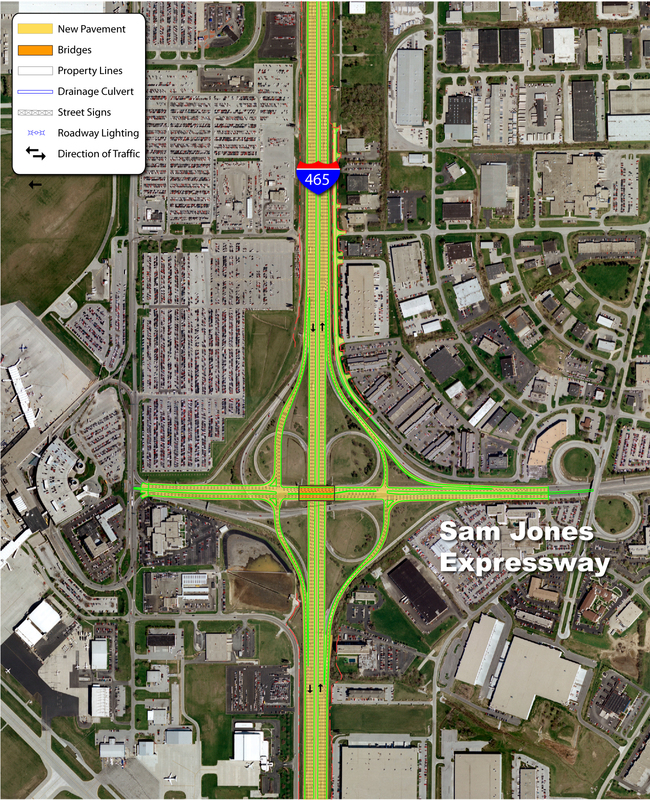 Continuing due north, Interstates 74 & 465 next meet Sam Jones Expressway at Exit 11. Formerly the Airport Expressway, the east-west freeway was renamed in 2007 after Sam Jones, a local civic leader, as the road no longer connected with the airport terminal. Photo taken 11/05/09. Second photo taken 12/24/11. Sam Jones Expressway leads east from parallel High School Road to Interstate 70 and Raymond Street at Maywood. The freeway facility opened in 1969 as a new route to Indianapolis International Airport.2 Photo taken 11/05/09. Second photo taken 12/24/11. 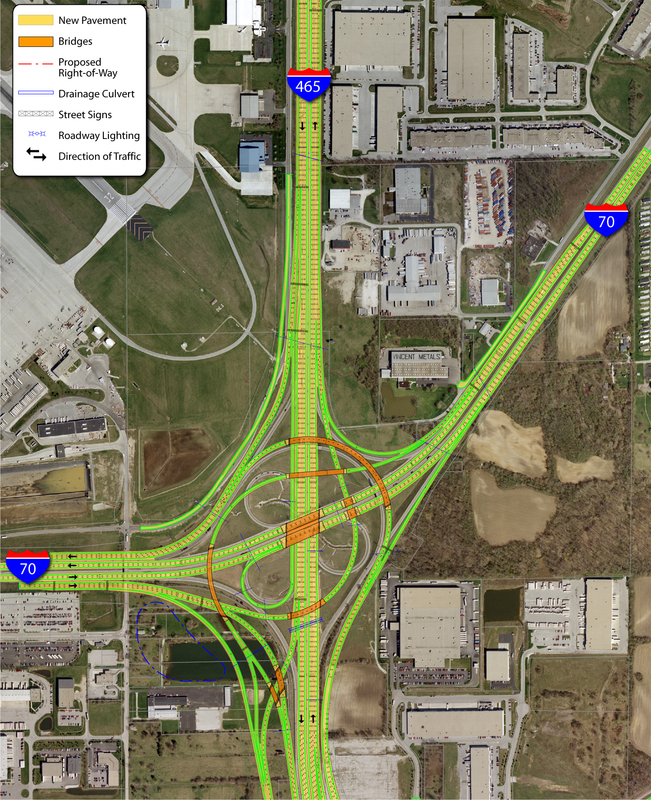 The Accelerate 465 construction redesigned the Same Jones Expressway exchange from a directional cloverleaf into a conventional diamond interchange and eliminated most of the loop ramps, including Exit 11B pictured here. Photo taken 11/05/09. Northbound scene along Interstates 74 & 465 between Sam Jones Expressway and U.S. 40 (Washington Street) west. 11 lanes of freeway now travel this stretch. The next four exits serve the Wayne Township area of Indianapolis. Up ahead is Exit 12, where U.S. 40 West will part ways with Interstates 74 & 465. Plainfield, in southeastern Hendricks County is several miles to the west along U.S. 40 West. Photo taken 11/04/11. Second photo taken 12/24/11. U.S. 40 leaves the Indianapolis Beltway for its original alignment along Washington Street west to Bridgeport and Plainfield. 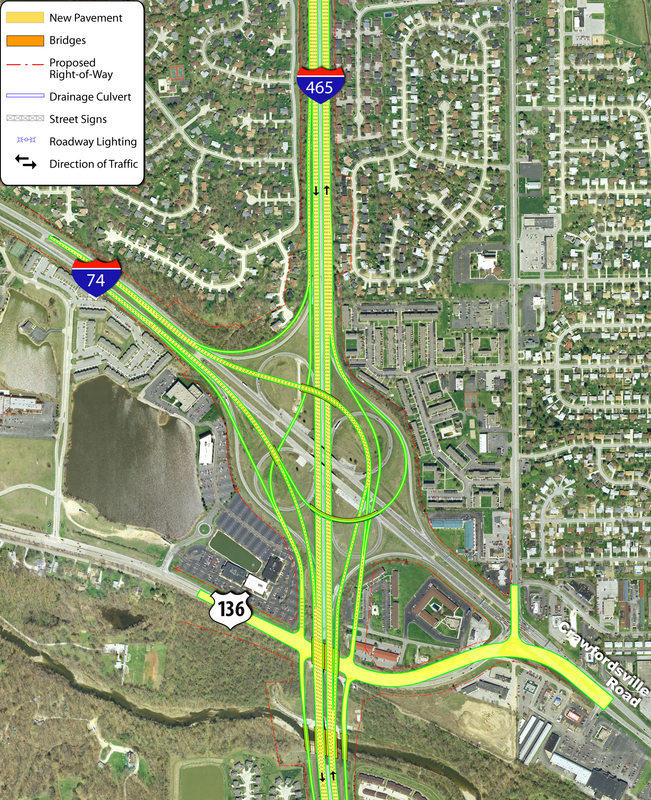 Roadwork reconfigured Exit 12 into a six-ramp parclo from a full cloverleaf interchange. Photo taken 12/24/11. All traffic to U.S. 40 west and Washington Street (Exit 12) departs in unison from Interstates 74 west & 465 north. Washington Street (former U.S. 40) east joins the beltway with Mickleyville and Lynhurst. Exit 13, serving U.S. 36 (Rockville Road) is a mile away. Photo taken 12/24/11. Exit 13 provides access to the growing western suburb of Avon and the Hendricks County seat of Danville. Photo taken 12/24/11. U.S. 36 leaves the Beltway at a parclo (Exit 13) interchange west to Tremont, Avon and Danville. 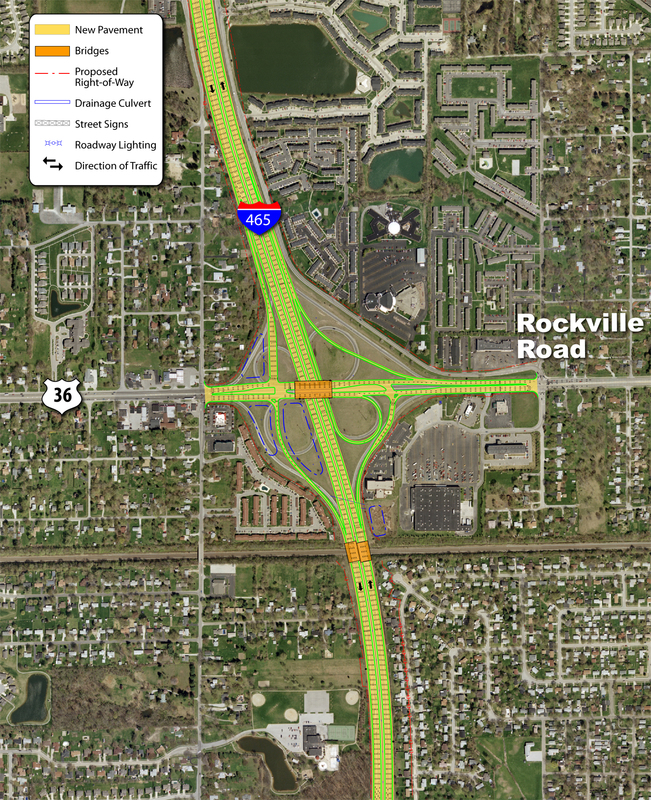 Originally a full cloverleaf interchange joined Rockville Road with Interstates 74 & 465. Photo taken 12/24/11. Rockville Road east from Exit 13 and Interstates 74-465 travels by Lynhurst to merge with Washington Street at Eagle Creek, where U.S. 36 and 40 originally combined through the west side of the city. Exit 14 for 10th Street is one mile away. Photo taken 12/24/11. Up ahead, 10th Street goes through the west side neighborhood of Haughville and Speedway. To the west the road heads out through Chapel Hill and Westwood and provides another route into Avon. Exit 14, along with upcoming Exit 16 provide the best routes for northbound traffic to the Indianapolis Motor Speedway on Race day. Photo taken 12/24/11. Exit 14 with 10th Street was redesigned into a conventional parclo interchange from an eight-ramp design during Accelerate 465 road work. New overheads now tout the two-mile approach of the Interstate 74 westbound split (Exit 16B) from the Beltway. Photo taken 12/24/11. A new diamond interchange opened in 2012 directly connecting the Beltway with U.S. 136 (Crawfordsville Road) west to Clermont. This replaces a connection along the old I-74 freeway stub to Crawfordsville Road. Traffic bound for Crawfordsville Road (U.S. 136 West) will head off toward the right past the 21st Street Bridge. Traffic bound for Interstate 74 West will exit off on its own ramp up ahead. U.S. 136 begins from Interstate 465 and travels 804 miles to Edison, Nebraska. Within Indiana, the US highway parallels Interstate 74 west through Brownsburg and Crawfordsville to Danville, Illinois. Photo taken 12/06/12. Exit 16A for U.S. 136 West (Crawfordsville Road) now heads off from the right as part of the new diamond interchange. Crawfordsville Road to the east is known as the Hulman Memorial Way and is the most patrolled traffic route into the Indianapolis Motor Speedway on Race Day. The second lane from the right now becomes an auxiliary lane for Interstate 74 westbound traffic, which exits off up ahead. Photo taken 12/06/12. Historical look at the Exit 16A ramp departure onto the I-74 freeway end with Crawfordsville Road. Photo taken 11/05/09. The right two lanes on Interstate 465 north now exit off onto Interstate 74 west, replacing a one-lane loop ramp that had existed before the interchange was rebuilt. The ramp then defaults onto westbound Interstate 74 as the highway departs the Speedway area toward Brownsburg, Crawfordsville and Peoria, Illinois. 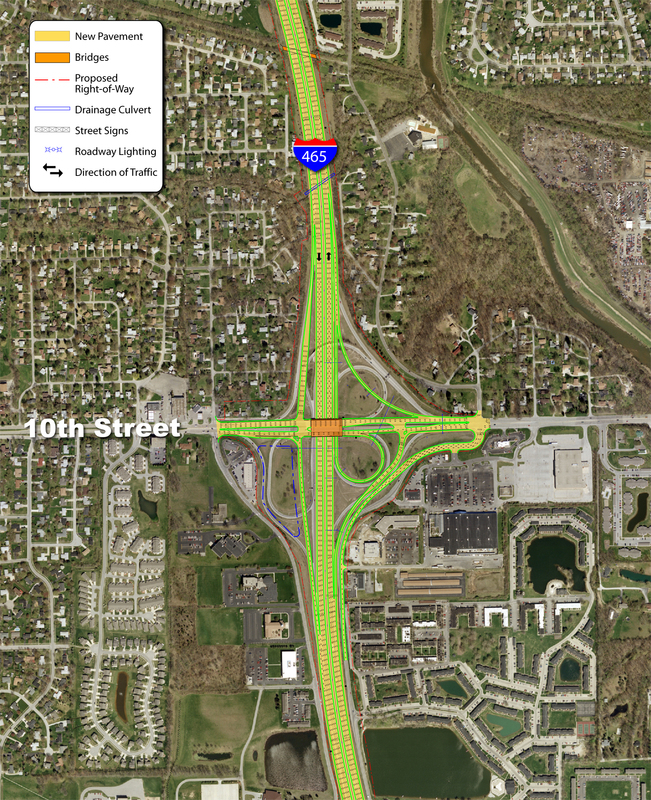 The 38th Street interchange (Exit 17) now lies a mile away on Interstate 465 north. Photo taken 12/06/12. The Interstate 74 westbound mainline was relegated to a single lane loop ramp (Exit 16B) from Interstate 465 north until Accelerate 465 replaced it with the two-lane high-speed ramp. This photo looks at the original split of I-74 west from I-465 north. Photo taken 11/05/09. 1968 Transportation Plan for Indianapolis, AARoads Forum post by Revive 755. "Mayor renames Airport Expressway to honor dedicated public servant," Greater Indianapolis Chamber of Commerce Press Release, June 19, 2007.